Divock Origi joined Liverpool from Lille in 2014 for a fee of around £10million – he signed for us on a five-year deal and was immediately loaned back to the French club for the first year of his contract. For the sake of context: Origi has scored 24 goals for us but hasn’t had a solid run in the first team since the 2016-17 season in which the then-21-year-old only managed 11 goals in 43 games. The Belgian has endured mixed fortunes at Liverpool but the one PL game this season he’s played the full 90 minutes was against Watford at Anfield and he scored – more often he will score a goal or assist when he starts. Origi also provided an assist when we beat Burnley in December – a game in which he played for over an hour – and let’s not forget his hilarious goal in the Merseyside Derby. A funny goal for sure but let’s not forget that he had to be in the right place at the right time to nod in the winner – I feel as if it were Daniel Sturridge then he mightn’t have been on the end of it. Some statistics can be misleading because someone may say Origi has only managed X amount of goals in Y amount of appearances but that doesn’t factor in the amount of minutes he played. 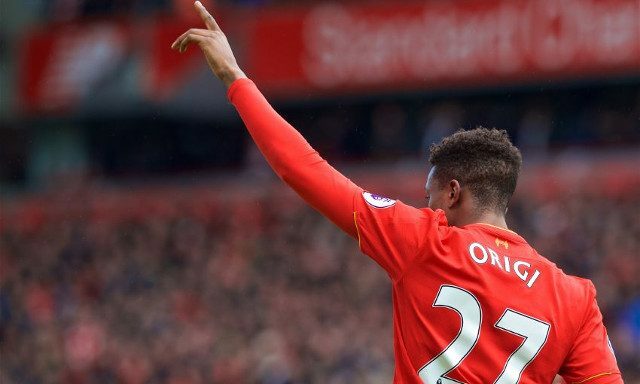 Third start of the season for Origi – assisted or scored in the other two. Considering Bobby Firmino rolled his ankle at Old Trafford and Origi scored on Wednesday, he’s definitely got a case to keep his starting position against Everton. I’m not suggesting Origi replaces Bobby every week, but when our no.9 needs a rest then I’d be more than happy to see the Belgian starting – be that upfront or on either wing. Origi filled in for Mane on the left against Watford while the Senegalese international filled in for Bobby in the central position – it was the fluidity of these two that gave Daryl Janmaat an afternoon from Hell. There was a lot the Belgian did off the ball too; if we’d take a look at the opening goal on Wednesday we’d see an unmarked Mane in the box because Watford’s defenders were busy marking Divock. Origi simply offers something different to Jurgen – he’s quicker than both Firmino and Sturridge and seems to be more than capable of hitting the target from range. Versatility is something Klopp brings up often; it’s one of the reasons James Milner plays so frequently and Origi’s ability to play anywhere across the front line can’t be overlooked.